Hey, everyone! Melinda Langston here, checking in to share all the exciting happenings here in Laguna Beach. With the tourist season winding down, the kids preparing to return to school, and only 136 days until Christmas (yikes! ), we locals are preparing for the upcoming Mobster Film Festival. The festival is a fundraiser for Angels with Paws, a fabulous local non-profit organization for seizure response dogs. As an animal lover and supporter of other local animal shelters, I was asked to head up the scholarship fundraising. Raising money for seizure sufferers to afford their own response dog, trained to retrieve needed items, turn off lights, or even carry needed medication. . . .how could I say no? Of course, it’s never that easy, is it? A local businessman, who had promised a sizable donation for the event, is found dead before handing off his check. And even though I'm not a suspect, someone I care about is. You can read all about it my crazy adventure next month in The Dogfather, book 10 in the Pampered Pets Mystery series. If you’d like to learn more about seizure response dogs or how you can support the cause, check out Paws with a Cause. 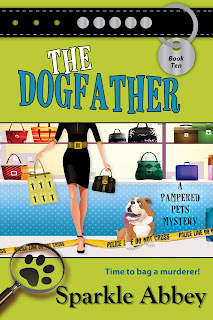 One last item, as part of the Killer Characters summer giveaway, Sparkle Abbey is offering your book choice from the Pampered Pets Mystery series. To enter, please tell the authors which book you’d like if you win, along with your name and email address in the comment section below. Comments close at midnight your time on Sunday, August 12th. I enjoy this series. Thanks for the chance to win one of the books. I'd like Raiders of the Lost Bark. Thank you. I would like The Girl with the Dachshund Tattoo. What an interesting post and good cause. I would love a copy of Yip/Tuck. Thanks for the giveaway. I'd love a copy of Raiders of the Lost Bark. Thanks for the chance! Those support dogs are amazing! I'd like Desperate Housedogs. I haven't read that one. Thanks for the chance to win one of the Pampered Pets books. I'd like Raiders of the Lost Bark. This sounds like a great series. I would really like to read "Downton Tabby". What a fantastic organization. If I win, I would love to read "Downton Tabby". Thanks for the chance. What fun thank you, KITTY KITTY BANG BANG. Thanks for the chance to enter and to choose a book, too. I would love to read Barking with the Stars.